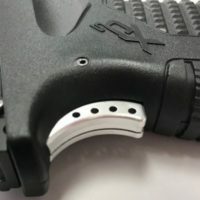 Hyve Technologies makes a replacement aluminum grip safety for Springfield Armory XDS pistols. Why do you need to replace the grip safety? I was looking for the answer on the company’s website and the only reason that I could find is to be able to have color options. Possibly, the different colors will make the custom builds look better especially with other small parts like trigger safeties and magazine extensions having the same color. The color options that are available now are black, blue, gray, OD green, purple and red. This replacement grip safety also has a perforated profile which should also be done for aesthetical purposes only. The MSRP of this product is $24.99 regardless of the chosen color. I have heard multiple times people saying that they like this or that model of Springfield Armory pistols but they wish there was no grip safety.